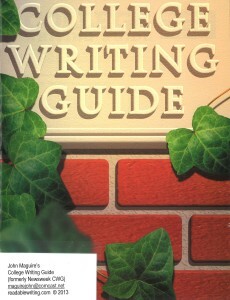 I used your College Writing Guide with my Advanced Grammar for ESL students, and my TOEFL preparation class last semester and saw great improvements in their writing. More importantly, they saw their writing improve. All students agreed that eliminating “be” verbs and using concrete nouns helped improve their syntax and style. This required a lot of hard work on their part. In fact one student who had repeated the class from the previous semester said that it was a much harder method than what we had tried before, but also much more productive. In previous semesters, I would tell the students to use concrete examples to make their writing more clear, but your exercises, having students move from abstract to concrete nouns, made the process more obvious. They understood the concept more clearly because they were practicing on a smaller scale, not in complete essays, but with your activities. As the semester progressed, and they started to write complete essays, they were able to self-edit, especially for the verb “to be”. It gave them hope that they could improve on their own; it gave them a strategy that they could apply in the future after our classes ended. Over our eight-week semester, “too many ‘be’ verbs” became our mantra. They developed a strategy of thinking through writing, just as you wrote in your response to John Langan. On the last day of class, they said that I should thank you for creating this booklet, and I encouraged them to write to you personally to thank you and tell you how they had improved. So, thank you for your wonderful book. I have ordered 20 for this semester through your website. I'll have a booth in Kansas City!